Raccoon Hat with Earflaps and Braids. Bandit-masked Raccoons are a familiar sight just about everywhere. They are highly intelligent and curious creatures. Image how cute your little one, or even you, would look wearing this. ** IMPORTANT ** –Please measure Childs head before ordering to ensure proper fit. Measure around the head just above the eyebrows for circumference and from the top center of the head to the bottom of the ear for height. You want the hat to fit snug because the hats do stretch to an additional 1” to 1 ½” larger than the circumference size to allow for growth. If you need an adjustment in circumference or height please let me know. For hygienic reasons these hats can not be returned if worn. 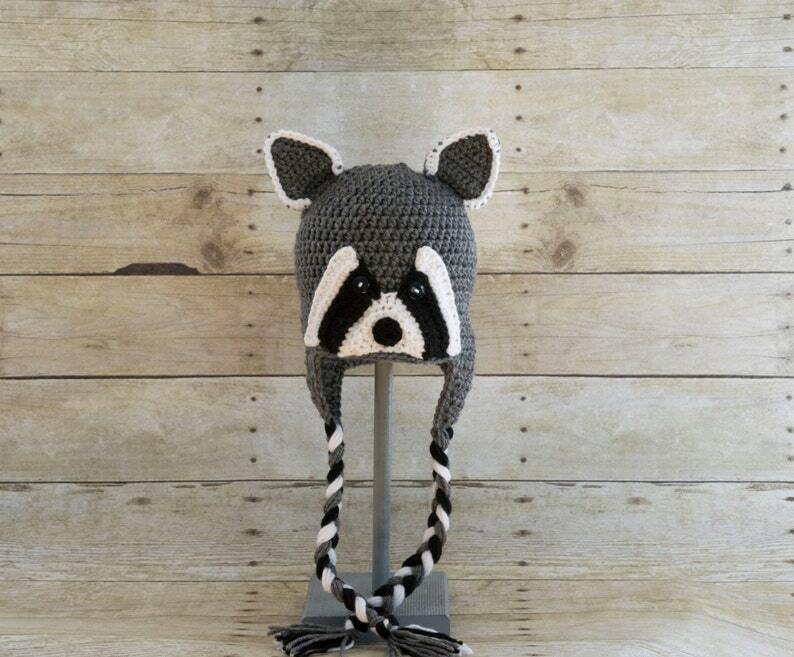 These hats are crocheted by me and are made to order so please allow up to 2 weeks for them to be made and shipped (although this is worst case scenario). Find me on FACEBOOK for new items, updates, and coupon codes. Super cute and warm enough for the colder days. Love it! It was supposed to be a gift, but I fell in love with it and kept it for myself! Absolutely adorable! Cannot wait to give to my niece for Christmas!!! !